This post is a summary of the pilot research project at Pratt Institute undertaken by Sydney Stewart and Samantha Nullman. This research was conducted as part of the INFO 685 course: Digital Analytics: Web, Mobile and Social Media in collaboration with the Digital Media department at the Whitney Museum. 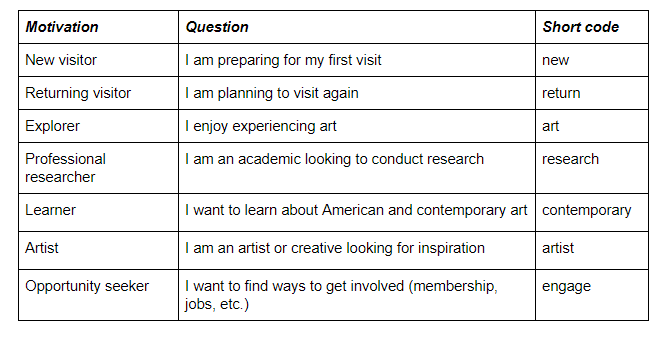 In order to discern users’ motivations for coming to the site, a visitor motivation survey (VMS) was implemented that asked users why they came to the whitney.org at the specific time. To best analyze and visualize how the separate segmentations interacted with the website during their visit, Google Data Studio was used to create dashboards of key metrics. Google Data Studio is a free data visualization tool that connects to data sources, including Google Analytics and creates interactive dashboards. As a student learning and engaging with data visualization tools, using Google Data Studio is both a challenge and a blessing. The biggest challenge we encountered was making the decisions to design the layout in regards chart types, graph metrics, page size etc. However, the ability to interact live with the data visualizations and have all the content side by side made it easy to spot trends. For our analysis using Google Data Studio, it was important to identify what data would important to gather. The first page contained basic demographic information such as age, gender, location and devices used to access the site. The second page focused specifically on behavior or content interactions. For the purpose of this research project, content was defined as exhibition pages, object pages, audio plays, and video plays. Examples of Google Data Studio pages for Overall Users. The first page is made up of basic audience demographic information while the second page focuses on specific content interactions. The pages were duplicated and applied to each segment. Using Google Data Studio made it quick and easy to distinguish significant similarities and differences across the segments and define common behavioral trends. It highlighted specific areas that would be useful to do more in-depth analysis and made pulling the data easy. The analysis of the data focused on specific types of content interactions and behaviors by profile on the site. Figure 1.1 shows the breakdown of how many sessions were from each segment. New and Returning visitors made up half of the segment sessions, while content driven users (Researcher, Enjoys Art, Interested in Contemporary & American Art, and Interested in Engaging) made up the other half. This split has the possible potential to vary depending on certain factors that can influence website traffic, such as academic year, exhibitions, or programming that might lead more people to the site for different reasons at differing times throughout the year. After analyzing each individual profile, there were several behavioral patterns that stood out. There is a potential opportunity to increase the visibility and usage of audio and video content. Interested in Contemporary Art and Researcher users were the most engaged with the audio content. The percent of each segment that engaged with video was often higher than the percent of each segment that engaged with audio. As a whole, there is room to better engage users with both these types of content, especially audio. This finding highlights an opportunity to make this type of content prominent in order to aid those using the site to learn. Finding 3: Object and Exhibition Page Reach The second key finding shows that users looking to explore more about art and the collection (such as artists, researchers and enjoys art) spent more time and clicked through mostly exhibition pages. The exhibition pages are good content sources for users because they contain exhibition descriptions, tour information, related object images, related events, videos, and audio guides. Enjoys art and Return Visitors users viewed more exhibition pages than other segments. New Visitors were less interested in exhibition pages than Return Visitors. Interested in Engaging users were the least interested in Exhibition pages but viewed more object pages than visitors. As expected, Researchers were the most engaged with object pages compared to all the other segments. Overall, object pages were less visited than exhibition pages, indicating the opportunity to create more opportunities for users to discover object pages. In regards to the online collection, there is room boost engagement with object pages. There is an opportunity to create a navigation structure, emphasize collection objects more heavily on the homepage to allow for increased interaction or improve the optimization of objects pages for search engines. The Whitney was successful at promoting the exhibitions and related content to exhibitions (such as audio tours of the objects in exhibitions). However, further work using this framework of analysis will provide more insight into how whitney.org users are interacting with the website and how to best serve their needs. Further research can also offer more insights about the website users for example surveys about satisfaction, the context of usage, user profile or surveys on specific sections of the website, those related to the visit vs. Collection and other content-heavy areas. This student project was not without major challenges and huge learning opportunities. While the VMS accumulated significant numbers of responses, it ran only for two weeks. This means that the data does not showcase how users are interacting with the site all year round. This indicates a need for repeated studies for comparison to gather deeper insights into user behavior. Additionally, the survey only prompted one question, which provides limited insight into user motivations compared to a longer, more in-depth survey. The pairing of the Visitor Motivation Survey with Google Analytics was the first learning opportunity. Google Analytics can tell a lot about user behavior but not why they came to the site and their personal interests. Alternatively, the Visitor Motivation Survey, without Google Analytics, only provides the basic segments of who the users are but not what they do on the site. Combining the two allowed for greater insights into user behavior overall. When our Pratt research group began the project, an initial challenge was the need to define what metrics would be most useful to focus on because it is very easy to start drowning in all the data that Google Analytics can provide. After setting the key demographic and behavioral metrics, it became clearer where to go with the direction of dashboards. Google Data Studio was the second big learning moment. Juggling the data for all seven segments was made much simpler by using Google Data Studio. Being able to copy each dashboard and simply switch the segment filter saved time and energy and allowed the desired data to be visualized consistently across every segment. Despite some limitations of the tools, the combination of a Visitor Motivation Survey, Google Analytics, and Google Data Studio allow for a useful method of web user evaluation and data visualization that can easily be replicated for repeat studies and compared over time. Following this research phrase, the Whitney has carried out a second VMS survey. The results of the second survey are not reflected in this post, however. Visitor Motivation Survey and Audience Segmentation for the Whitney Museum of Art Website was originally published in Museums and Digital Culture – Pratt Institute on Medium, where people are continuing the conversation by highlighting and responding to this story.